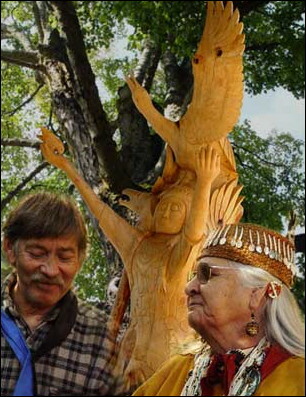 Eme'tek!iyikíkh was dedicated in downtown Ashland on September 30, 2006. In the Takelma language, the name means, "We are here, we are living in this place, we are happening in front of you." Six years later, to protect the wood from weathering, the original sculpture was moved indoors to the Hannon Library at Southern Oregon University. 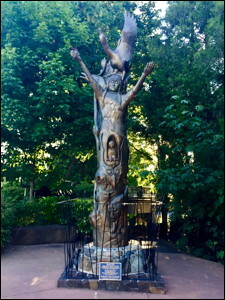 A bronze replica was installed on the original downtown site in May, 2013. At that time, the name Eme'tek!iyikíkh was removed from the plaque and from literature about the sculpture. The current name is We Are Here.